Sadly, medical crises are the most common emergency that anyone will ever face. Firearm-related injuries are far less common than serious automotive or work -related injuries. You can survive any number superficial wounds without immediate treatment, but not a major trauma. 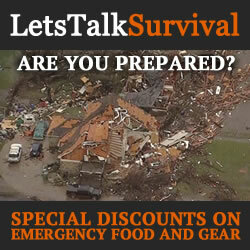 Having the right gear on hand at the right time can save lives, maybe even your own. Military servicemen and Patrol Officers commonly carry some form of Individual First Aid Kit (IFAK) or Individual Patrol Officer Kit (IPOK) which are essentially personal trauma kits. Typically, they include at least one pair of Nitrile gloves, some compressed gauze, an Israeli or OLAES bandage and a tourniquet. In recent years, it has become commonplace to carry a backup kit, or at least a secondary tourniquet as part of your EDC for those times when multiple injuries occur. But tourniquets come in all different shapes and sizes, and some of them are quite large which is an obvious problem. Some years ago, Jeff Kirkham, a 28-year Special Forces veteran of US Army, author and inventor developed a low-profile tourniquet that solves some of the problems with bulky expensive tourniquets. The patented compact and lightweight design of the Rapid Application Tourniquet System (R.A.T.S.) was based heavily on feedback provided by first responders and soldiers on the battlefield who deal with medical emergencies every day. Jeff took what he learned and engineered a single-handed tourniquet that is both easy to use and fast to apply. RATS tourniquets are made right here in the USA from a rugged flattened elastic band with a solid vulcanized rubber core and a durable protective nylon sheath that is currently available in red and black, and three hi-vis colors; blue, green and orange. The band itself is 48″ long, 0.5″ wide and nearly 0.25″ thick. One end of the band is securely attached to an aluminum cleat, then looped back through the cleat to form a 3-finger loop used to provide greater leverage when applying the tourniquet. The small uniquely-shaped aluminum cleats are designed in such a way that the band can be cinched down from either side of the cleat providing a secure anchor point no matter which direction the tourniquet is facing. At only 2.8-ounces, the compact and lightweight RATS Tourniquet can be stowed in a number of readily-available methods including elastic sleeves, pouches, buttstock wraps, and even the R.A.T.S. Sling. I’ve also seen them strapped to the outside of an EDC pack and bound to a plain old rifle sling. But the most common way that I’ve seen is to coil the tourniquet in such a way that it will hold itself flat, and small enough to fit in a pocket, pouch, or just about anywhere. 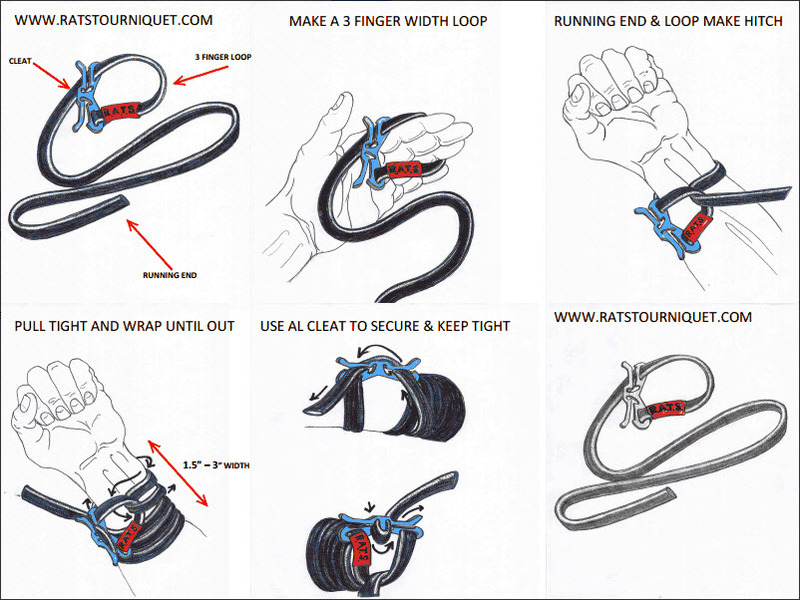 The best part about coiling the tourniquet up like this is two-fold; Not only does it keep itself flat and well-organized, if you push the roll through the loop, the band is already properly positioned with the running end through the three-finger loop for a rapid application. 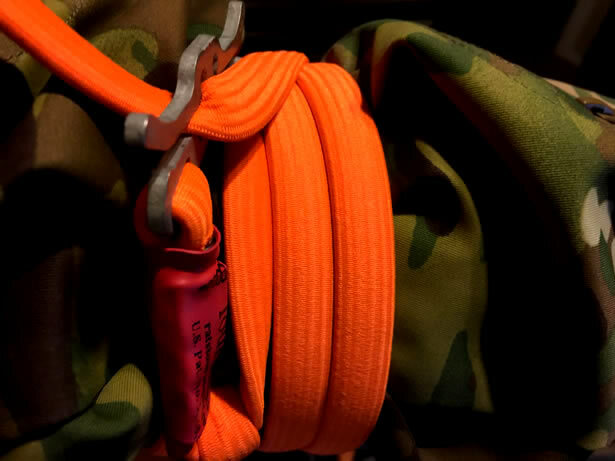 Just pull the roll out of the loop and the running end is ready to wrap around the extremity before threading it through the three-finger loop. 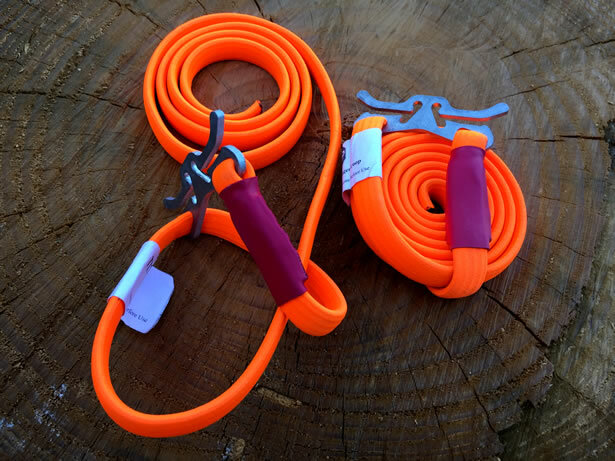 Having the running end pre-positioned through the three-finger loop is ideal for arm applications where you can simply lasso the extremity with the tourniquet, sliding it up to the highest point possible on the extremity. Leg applications on the other hand, it is much easier to thread the running end through the three-finger loop in place rather than slipping it over it over the foot and then sliding it all the way up the leg. It is always a good idea to practice the most efficient and effective methods of applying tourniquets and pressure bandages to all four extremities regularly. Practicing single-handed applications with both dominant and nondominant hands well enough to develop muscle memory is essential to a positive outcome, especially when every second counts. Not fumbling around with packaging, instruction cards and liner notes, or the device itself. Applying the RATS tourniquet is really quick and easy to use with a little practice. The manufacturer claims that it is the fastest and easiest tourniquet to apply on the market. But speed comes with practice, so while I agree that it is quick and easy to apply, I also believe that this is really an arbitrary claim. With enough practice, anyone can do most anything well. Once you’ve determined the desired location to apply the tourniquet and it has been wrapped around the limb with the running end of the band already threaded through the three-finger loop, you are ready to begin. The three-finger loop acts much like a trucker’s hitch to generate the leverage necessary to effectively occlude blood flow to any extremity. To properly apply the tourniquet, the cleat, loop (hitch) and running end should be facing you directly, but more toward the upper circumference of the extremity. This will provide the cleat and loop enough room to move as you pull on the running end to cinch the tourniquet down. 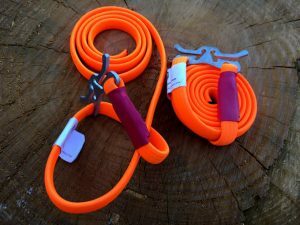 It is important to prevent the cleat and loop from rolling around to the back-side of the extremity where it will be difficult to tie off the end around the cleat. You never know when you might need to adjust the band ourself. 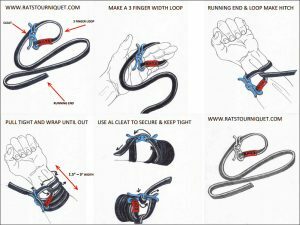 With the running end of the band protruding through the loop and cinched down firmly, begin to wrap the band around the extremity sequentially while keeping plenty of tension on it. To limit the risk of nerve and tissue damage, it is important to wrap the band around the extremity three or more times if possible without twisting or overlapping the band. I always try to wrap the band evenly with approximately 1/4″ between each wrap to reach the desired width of 1.5″-2″ or more. As a result, you might have some difficulty applying the RATS Tourniquet over larger thighs. One clear advantage over many of the traditional nylon strap tourniquets is that elastic band tourniquets are very effective on small limbs like those of working dogs, infants and small children. Additionally, there are no stiff straps, buckles or a windlass to contend with. Large bulky straps with Velcro and buckles are difficult to apply and they simply do not function well on these types of small-diameter limbs. 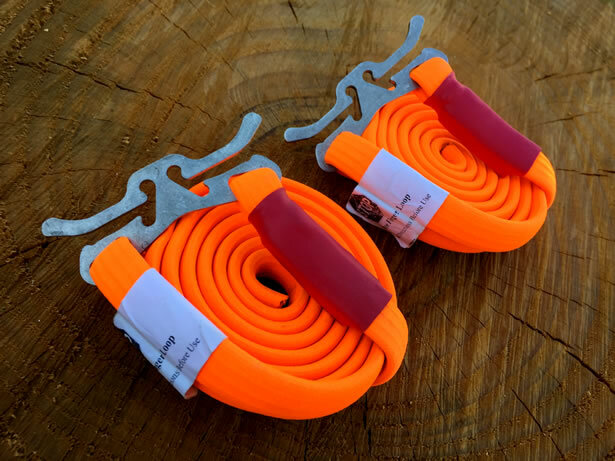 Once the band has been wrapped around the extremity as recommended, simply pull the end of the band around the slits on the cleat until it has snapped all the way into the cleat and locked itself firmly in place. The RATS Tourniquet’s flexible nature allow it to to expand and contract as necessary to accommodate any flexure, movement and swelling that might occur without any loss of compression. RATS Tourniquets have their fans, and they certainly have their detractors. But the reality is that no one tourniquet is ideal for every situation. Personal experiences and coordination play a big part choosing what would be best for you. What might be easy for one person, could be dangerously problematic for another. I would encourage everyone to train with a number of different options and then choose the one that they are most comfortable administering as their primary EDC. Beyond what a tourniquet was designed for, I’ve also seen many videos on YouTube showing people using the elastic band to strap gear down to their packs in a pinch. I was a little surprised at this, but I can certainly see the value when you have nothing else to use. Another would be as a wrap for a makeshift splint or an arm sling. There are tons of possibilities with a little imagination and some ingenuity. Because there are so many demonstrations out there showing RATS Tourniquet at work, I chose to focus my testing more on how fast and easy it was to learn and apply without testing for a complete occlude of the blood flow to each extremity. I would time myself applying the tourniquet on both my left and right arms as well as both thighs, three-times each and averaging the time between them. To make things a little more difficult, I also decided to apply the tourniquet over denim jeans and a softshell jacket. I also decided to test how well it would stay in place and whether or not the pressure would be affected. After quite a bit of practicing, I was ready to get the testing underway… With both hands flat on the deck and a coiled tourniquet sitting on the table in front of me, I started applying the tourniquet on my left arm exactly as I had done all those times before while I was practicing. Before each attempt, I re-coiled the tourniquet just as before. Then after three attempts on my left arm, I switched over to the right. The average time that it took to apply it on my left arm was 21 seconds, and 23 seconds for my right. I used the method of pushing the coil through the loop to preload the tourniquet prior slipping it over my hand, then sliding it all the way up to the top of my bicep. I found this method shaved quite a few seconds off the time it had taken as I was just learning to apply it. My only cause for concern had to do with the wide range of motion required to apply the tourniquet with just one hand. Since I could utilize both hands to apply the tourniquet to my legs, I did not want preload the tourniquet which would have required me to slip the tourniquet over my foot and then up my leg. 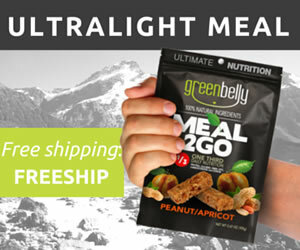 I felt it would not only be much faster to apply it in place, it would also be much easier. Therefore, I would need to pull the coil out from the wrap to keep it from preloading. I started off with both hands flat on the deck and the tourniquet coiled up on the table just as before, then I applied it to one leg after the other, re-coiling the tourniquet each time. From start to finish, I averaged 19 seconds on each leg. I found that it required quite a lot of tension on the band as I wrapped it around my leg in order to achieve the desired width. I tried moving my arms and legs around as best I could while the tourniquet was on and I did not notice any reduction in pressure once I stopped moving until I released the band. It was pretty incredible to see just how much a little extra practice helped… I felt confident and didn’t feel like I was fumbling whatsoever. Granted, in a real emergency that may not always be the case. But after these simple tests, I surely can attest to the immense value of practice. After applying the tourniquet at least few dozen times on my arms and legs, they were very sore. In fact, it took an entire day before I stopped feeling uncomfortable. RATS Tourniquets are made from quality materials free of complicated buckles and straps. It offers a clear advantage when it comes flexibility, accommodating movement and swelling. It’s unique and simplistic design make it quick and easy to apply when seconds count, even on animals, infants and small children. It’s compact form factor make it ideal as an EDC option as well as first aid and survival kits. There are many different tourniquets on the market, each with different features and benefits… But no tourniquet is ideal for every situation. The best tourniquet is the one that you have with you when you need it most. At a little less than $20, RATS Tourniquets so affordable, you could choose to carry two.